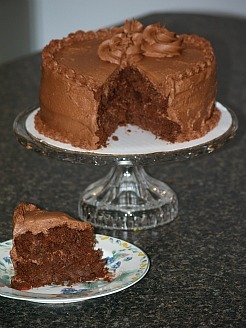 When you learn how to make a chocolate layer cake you will find it makes a more elegant presentation than a sheet cake. Chocolate layer cake recipes can be as simple as frosting between layers, sides and top with a simple sugar icing. To spruce the cake up a little more add a delicious filling between the layers or slice the layers horizontally and add a filling in the middle. For really elegant special occasions decorated the cake with a delicious butter cream frosting and decorate with flowers and chocolate leaves. However you do it, you cannot go wrong with a moist chocolate cake. Enjoy cooking with chocolate because everyone loves chocolate! Indulge yourself in learning how to make chocolate layer cakes you find below. You'll want to gift yourself and your friends with this decadent treat. Grease and lightly flour 2 nine inch round cake pans. Melt chocolate in a double boiler and remove from heat. Blend in sugar, cornstarch and beaten egg yolk; mix well. Add in 1 cup milk and cook in double boiler, stirring constantly, about 15 minutes until smooth. Cool by placing bottom of pan in ice water. Cream together butter, brown sugar and 2 egg yolks; beat until light and fluffy. Add the vanilla to the remaining 1/4 cup of milk. Add the flour mixture and the milk alternately to the cream mixture; blend thoroughly. Cream sugar, butter, eggs and vanilla until light and fluffy. Sift flour, soda, salt and cocoa together. Add flour mixture alternately with water to the creamed mixture. Beat until smooth and pour evenly into prepared baking pans. Cool completely before adding your favorite frosting. When you learn how to make chocolate layer cakes you will find that they are not the only great chocolate cakes. This chocolate zucchini cake recipe is baked in an oblong pan and the zucchini makes this chocolate cake delicious! Cream butter, oil and sugar until light; beat in the eggs one at a time while beating and add vanilla. Add dry ingredients alternately with buttermilk to creamed mixture. Stir in zucchini by hand. Pour batter into prepared pan and bake 55 to 60 minutes or until pick comes out clean. Sprinkle with chocolate chips and nuts while still hot; let cool. Besides chocolate layer cake recipes, some cakes might call for strange ingredients. Don’t think you are making a mistake in reading this recipe! 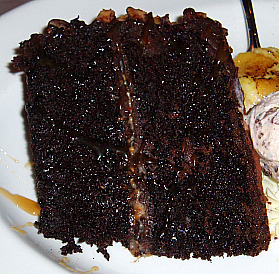 It does include sauerkraut but you will not believe how delicious this cake is. This sauerkraut cake recipe is so moist and you don’t taste the kraut. If you refrigerate it to keep, just bring to room temperature before serving. Preheat oven to 350F degrees. Grease and flour 9 X 13 inch baking pan. Squeeze excess moisture out of kraut; chop finely with knife or food processor. In a large bowl beat butter and sugar until light and fluffy; add eggs one at a time while beating. Add vanilla, cocoa powder, baking powder, salt and baking soda to creamed mixture; blend well. Add flour alternately with water to the creamed mixture. Fold in the sauerkraut and pour into prepared baking pan. Bake about 50 minutes or until pick comes out clean. Cool and frost with favorite frosting. Whether you are baking a chocolate layer cake recipe or a single layer cake, orange flavor goes well with chocolate. The following chocolate orange cake recipe is delicious and easy to make. Cream sugar and butter until fluffy; add eggs one at a time while beating. Add dissolved chocolate and vanilla to creamed mixture and blend well. Sift the flour, soda and salt together; add flour mixture alternately with milk to creamed mixture. Pour batter (will be thin) into prepared pan and bake about 40 minutes or until pick comes out clean. Frost with orange coconut icing. Cream butter and sugar together; thin with juice. Beat in coconut and spread over cake. 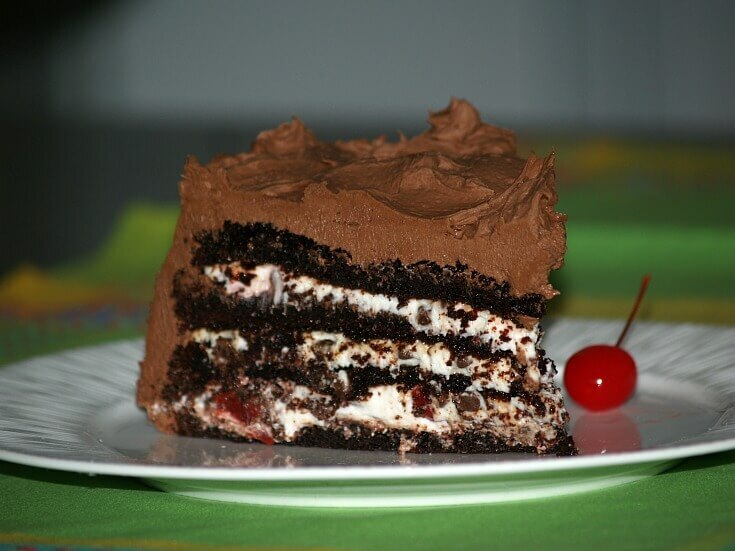 This chocolate layer cake is a beautiful presentation! 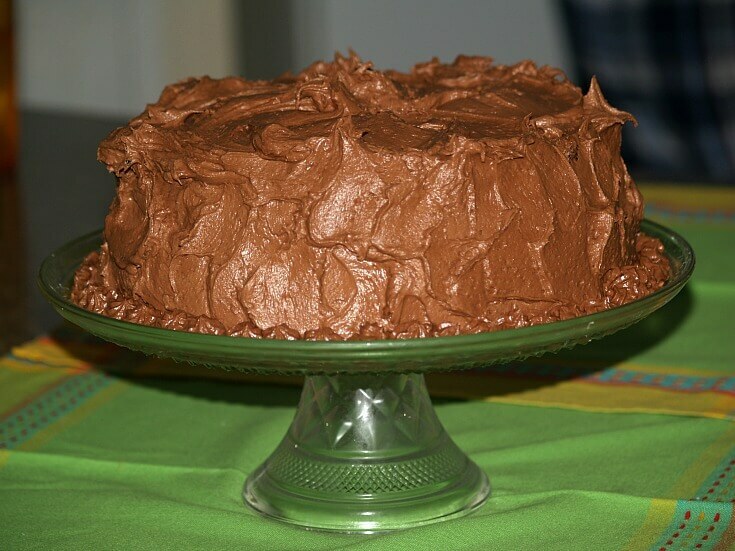 This is a moist ricotta filled chocolate cake which makes it one of my favorite cakes. Preheat oven to 350F degrees; grease and flour 2 eight inch cake pans. Sift together sifted flour, cocoa powder, baking soda, baking powder and salt; set aside. Mix together on medium speed the sugar and oil; beat in eggs and vanilla. Combine cold coffee and buttermilk; add to sugar mixture alternating with flour mixture. Divide evenly between 2 prepared pans; bake 25 to 30 minutes until pick comes out clean. Let cakes cool 10 minutes and then remove from pans. Cool cakes completely; slice layers in half horizontally making 4 layers. 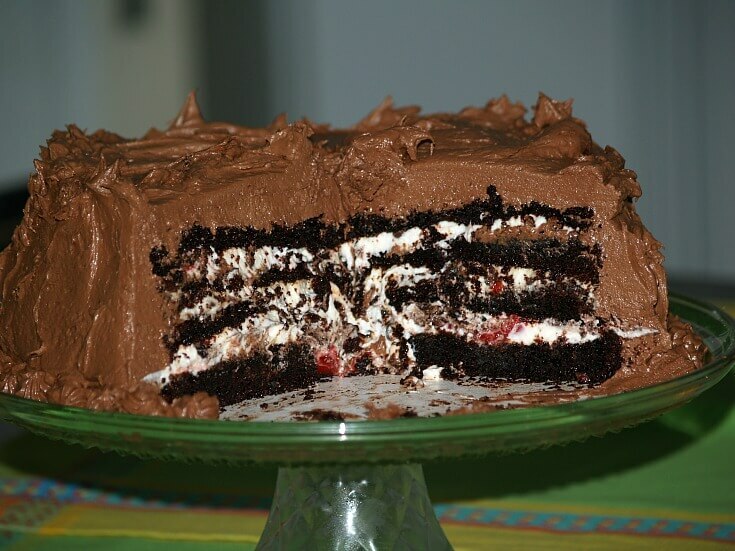 Spread fillings between layers (Recipe below) and frost (Recipe below) sides and top of cake. Beat sugar and ricotta cheese together; fold in cherries and chocolate chips. Sift together powdered sugar, cocoa powder and salt; add meringue to mixture. Cream shortening and beat in flavorings. Add dry mixture alternately with water to the shortening mixture making a spreading consistency.